Review: Fit are ye haverin aboot? 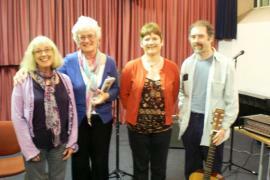 This was a great evening of song, poetry and stories from Morag Skene, Tom Dailly, Linda Smith and guest Gráinne Smith (no relation). Morag's opening number, an ironic song by Kristin Olsen Stop Doing So Well got everything off to a wonderful start accompanied by Tom Dailly's beautiful guitar playing. The evening progressed with more delights — Linda Smith's evocative Halloween story took many of us back to the kitchens and back gardens of our childhood where the ancient rituals of neepie lantern making and the perilous skills of letting off the fireworks on the back green were handed down to the next generation. Morag Skene's story Dirty Duncin raised similar smiles and resonances with the small but appreciative audience. Scots words and inflections well handled give a feeling of being at home. But it can also deal with weightier reflections as in Linda Smith's poem My Gaitherin about her family roots and the sterling people who made them. Gráinne Smith's excellent set included the poem Limmer, a similar example of the power of Scots dealing as it did with the response of fishermen's wives to the sea. Tom Dailly's playing and his own songs Hurry Bella and In Heaven were sensitive and engaging. Originally from Glasgow, he's now in the North East — Glasgow's loss. Four great performers — heroes really — in a truly horrible venue. They gave terrific performances in a room with minimal lighting, unsettling décor — did I catch a glimpse of a vampire in the sinister drapes — and very poor soundproofing. Something involving hooching, stamping and possibly an accordion was constantly intruding through the ceiling. Someone else was having a guid Scots nicht and good luck to them but we were trying to enjoy our own! So thank you Morag, Linda, Tom and Gráinne. You're stars. Well done Spring Tides for putting this on. Just get a better venue next time.